Join the discussion on our forums! Come discuss Webweave over in our dedicated Webweave discussion topic. What it should have been. 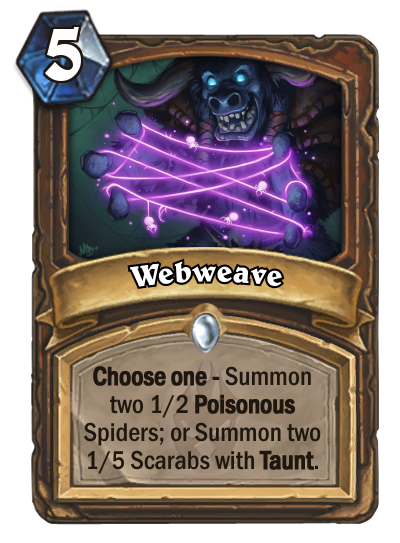 Introduce some kind of spider mechanic that will allow Hadronox to see some play. One of the worst cards of the expansion. You can get Stubborn Gastropod for 2 mana each and they have taunt. Ha, I knew this card isn't trash. why do all the bad cards get the best art? This probably my favorite art AND favorite golden animation for the set, its a shame its for such an underwhelming card. But who knows, crap cards have surprised us in the past. Originally it was the same but costed (4). Too bad there are no spiders anymore. ._. I think people are underestimating this card's potential. According to Team 5, they had this card at 4 mana but it was a bit too efficient. Two Poisonous 1/2's demand removal and are always a threat. I think people are gonna be surprised by this card. This is a waste of five mana, your opponent could easily play primordial drake, dragonfire potion, hellfire, etc. 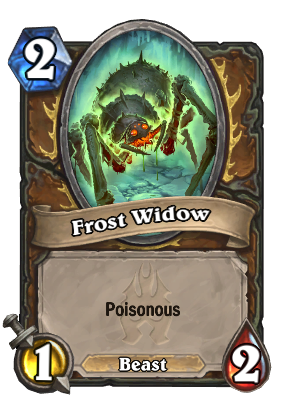 The fact that thease could also be taken out by pretty muck any small attack minion also shows that for this to increase the chances to see play (though I still doubt it) would to either give thease spiders higher stats, or lower the cost, or both. 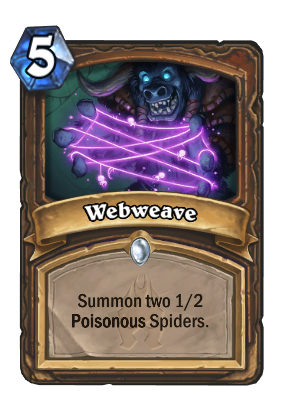 You get two tiny minions for the price of 5 mana, This card won't save you when you're facing aggro due to lacking taunt, this card won't help you gain control due to the spiders lacking enough health to resist Aoe. It can be controlled by priest, and its a Common card at that.